Kikay was born on September 26, 1998 in northeastern Ohio. Her real name is Leilani Mae and she’s my elder sister’s first born. I first met her when they traveled to the Philippines in September, 2000, a few days before her second birthday. Back then, she was a pretty two year-old who wasn’t afraid of people. She was so active and so restless. She has a duck-like gait, that’s why we called her “kikay”. 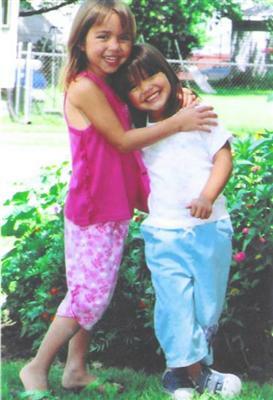 Leilani spent six months in the Philippines with her mother and younger sister Isabel, who was six months at that time. She would play with my nephew Gabriel, who is a year older than her, and eventually learn how to speak Tagalog. Her grasp for the language was so good she could even say the word “binubutingting” perfectly. Now, she can still understand it but can only speak a few words. Her mom talks to them in Tagalog. Kikay’s mom would bring her to the beach, playgrounds and amusement parks. Just put her in an inflatable tube and she’d try to swim by herself. She loved the train attraction at the amusement parks that she would ride it again and again and sometimes without any companion. She also didn’t mind the very high slides in the playground. She would climb them without any help from adults even if the platform was over 15 ft tall (like the one in Clark Playground in Angeles City). Last night, I called them up and talked to Kikay about her birthday. She said they’ll be celebrating on the 25th but her real birthday is on the 26th. And that they’ll celebrate it on Sunday because people have work on Monday. Her mom said that they (Leilani and Isabel) now love “Lizzie Mcguire” and Hillary Duff. I thought they flipped out when I told them that the girl who played Miranda in the show as Lizzie’s best friend is a Filipina, Lalaine (who’s so proud of her Filipino ancestry and who doesn’t seem to have the IMSCF syndrome). Well… I haven’t sent her any gift for her birthday but her mom said a card with a bill in it will suffice. So I’ll do just that (mwehehehe!). HAPPY BIRTHDAY KIKAY! I hope your wishes will all come true. if you happen to come to Cebu, please do stay at Cebu’s finest spring resort…..